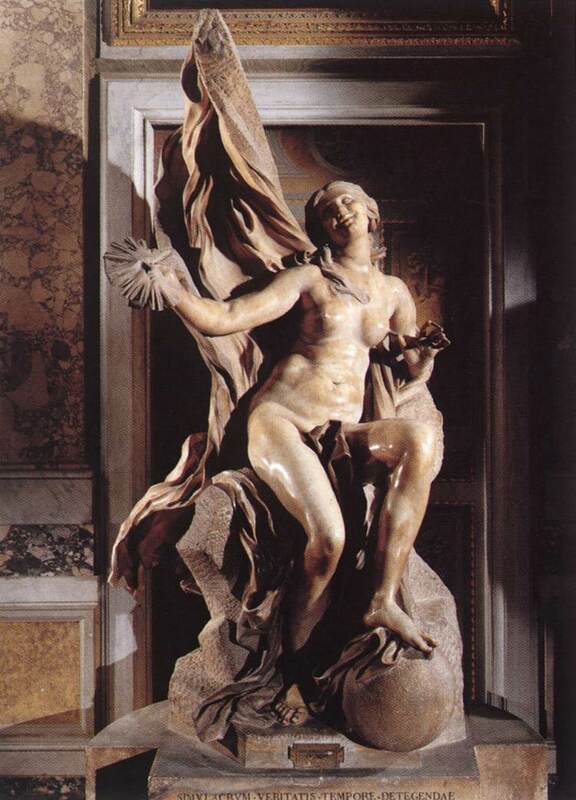 Bernini created Truth Unveiled by Time as a form of self-care. The 1640s were rough for our favorite Italian Baroque sculptor. Pope Urban VIII had assigned Bernini as the head architect for the St. Peters’ towers. Bernini’s towers displayed cracks due to faulty foundations built decades earlier, and Urban ordered the towers destroyed. Like any successful artist, Bernini had enemies and his enemies wasted no time destroying his reputation by sensationalizing the event to the public. Bernini was left humiliated, but not hopeless. He began Truth Unveiled by Time to console himself, firmly believing he would one day be rightfully vindicated. Truth may have been beautiful in Bernini’s eyes, but his sculpture of Truth was the first instance in which Bernini turned his back on classical ideals of female beauty in his work. By 17th-century standards our girl Truth had overly elongated legs, bulging eyes, an oversized nose, and manly chin. It’s possible these characteristics were inspired by Bernini’s devoted patron Queen Christina of Sweden. Another “unattractive” quality were her spread-open legs, which in traditional iconography meant the communication of sexual messages to the viewer. Add that to the fact that the sensually fleshy Truth looks a little too delighted to have her clothing stripped off, plus Father Time looking extremely predatory in Bernini’s preliminary sketch, and suddenly this sculpture doesn’t seem so family-friendly anymore. These subtle suggestive details indicate Truth Unveiled by Time could also be an example of immoral male voyeuristic desires in the style of stories like Susanna and the Elders and Diana at her bath. Despite being unfinished and weirdly sexual, Truth Unveiled By Time was well-liked enough for a popular saying to be going around claiming “truth could only be found in Bernini’s house.” But not everybody liked the statue. Bernini attempted to gift the sculpture to a French minister in return for his good will, but was rejected for being too obvious in wanting political protection and for not deciding to move to Paris upon the minister's invitation. Well, you can’t win them all, and that’s the truth, Ruth. Franco Mormando, Domenico Bernini: The Life of Gian Lorenzo Bernini, (University Park: Penn State University Press, 2011), 139, 154-155. Robert Wallace, The World of Bernini (New York: Time Life Books, 1970), 86. Francisco Mormando, Bernini; His Life in Rome (Chicago:University of Chicago Press, 2011), 156, 158, 224. Rudolf Wittkower, Bernini: The Sculptor of the Roman Baroque (London: Phaidon Press, 1997), 185, 193. Check out the full Wikipedia article about Truth Unveiled by Time (Bernini).